It was a quiet week for the acquisitions department here at Winkelman Abbey. But what it lacked in the X axis it more than made up for in the Y. 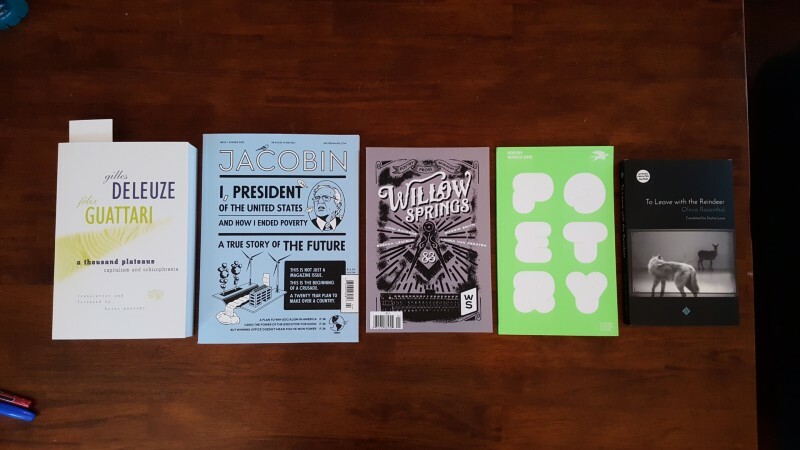 From left, we have A Thousand Plateaus by Gilles Deleuze and Felix Guattari, followed by the most recent issues of Jacobin, Willow Springs, and Poetry Magazine. On the right is To Leave with the Reindeer by Olivia Rosenthal, the latest from my subscription to the catalog of And Other Stories. All of which is to say, one deliberate purchase this week. I feel like I have been orbiting Deleuze and Guattari for a very long time. Back in my Angry Young Man days in the late 1990s I amassed a collection of titles published by Autonomedia and Semiotext(e), publishers of very wild and far-out titles from a wide variety of unconventional, leftist and radical writers and thinkers. One of those books (unfortunately lost in a long-ago purge) was Nomadology: War Machine, from the chapter of the same title in the then-unknown-to-me A Thousand Plateaus. I understood very little of it at the time, but it haunted me. These were words from thinkers operating on a plane of existence so far above my own that they might as well have been performing magic. Over the years I forgot their names but the sense of the conversations stuck with me. It felt like peeling back a layer of reality and seeing some of the inner workings of the universe. This past summer my girlfriend and I traveled to San Francisco where we made a pilgrimage to City Lights Bookstore, which had been a goal of mine for some decades. Wow, what a store – probably the best-curated bookstore I have ever seen. The Philosophy section held scores of titles and thinkers which were new to me, or which I had only ever seen as references in other places. And of course. A Thousand Plateaus was one of them. That brought Deleuze and Guattari back into my awareness. Shortly thereafter I borrowed Plateaus from the Grand Rapids Public Library, attempted to make sense of it, and made almost zero headway. Then I did so again, a month later. Then I resigned myself to the fact that I will be forever haunted by D and G if I did not add this book to my personal library, and so here it is. In the reading side of things, I finished The Black God’s Drums by P. Djeli Clark this past Thursday, and absolutely loved it. Probably my favorite read of the year so far. Clark’s use of language and patois in world-building is wonderful and, though this is not precisely the New Orleans so near and dear to my heart, it is close enough to make me feel some serious longing and wanderlust. Currently I am a little over halfway through Scarborough, by Catherine Hernandez. I picked this one up several months ago and attempted to read it while on a business trip to Las Vegas. Reading that book in that city made me want to burn everything to the ground. So I set it aside. Now that I am not in the worst city in the world I am able to read and enjoy this beautiful, heartbreaking book. Excellent interview with Marlon James, author of the newly-released Black Leopard, Wed Wolf. If you have the time and inclination, you can listen to four hours of David Bowie. The In Theory column at Ceasefire Magazine. If Property Rights Were Real, Climate-Destroying Companies Would Be Sued Out of Existence. The Naropa Poetics Audio Archive – 5,000 hours of lectures, discussion and reading from the Jack Kerouac School of Disembodied Poetics at the Naropa Institute. “Luck, or Something Like It” is a flash fiction inspired by the prompt “Luck” from Chuck Wendig over at Terrible Minds. This scene immediately follows my previous story “Looking At Ourselves“. Professor Smith dusted off his jacket and looked around. The room in which he suddenly found himself was huge, with no walls, and a suggestion of a ceiling far overhead, but that could also have been low cloud cover. The space was quite crowded. The floor was uneven and seemed to be made of stone, and he changed his assessment from “room” to “cave”. Smith smiled and waved. Professor Lin shouldered her way through a crowd of young people, who Smith vaguely recognized as his neighbors. “Lin! Over here!” yelled Smith. Lin made her way carefully to Smith, glancing down at the floor. “I think so,” said Smith. “Good man, was he?” said Smith. And elderly man, with a bald head and bushy moustache, wandered over to join the two academics. Lin took one of his hands. “And we’re sure this is the Bardo?” said Lin. “Beats me,” said Jerry. “I don’t know who’s really in ch-” He abruptly vanished with a small “pop”. Lin and Smith stared at the empty space, then at each other. “Maybe he came back as a microbe?” said Smith. “But it’s not really ‘after’,” said Lin. “So we just have to trust in a higher power?” said Smith. “Or a lower one.” said Lin. “A deeper octave of a fractal?” said Smith. “So at some level it is all determinism,” said Smith. He sighed and shook his head. “Time and good behavior,” said Smith. “I guess this is goodbye again,” said Lin. “And no terrible vodka this time,” said Smith. Lin smiled. Smith vanished with a small pop. Lin closed her eyes as a wave of vertigo washed through her, and reopened them to something completely unexpected.